Today's Spectraflair franken was made with a cream polish, well diluted with clear. I wanted to make a nice dark navy holo, and this worked out rather nicely. I've called this one "Milkyway", in reference to the starry sky at night, not the chocolate. I thought this next picture was cute, with one of our cats, Ricky, sitting on the top perch of their cat run. He's all blurry, but he was busily watching me. Today I'm also sharing some other info I found out about spectraflair. When I ordered it, JDSU wanted to make sure I was aware that the product contained MgF2. Which after Googling, I found out is Magnesium Fluoride. In fact Spectraflair is metal-coated Magnesium Fluoride, which is what creates the rainbow prism refractions. So next I did some more Googling about Magnesium Fluoride and nail polish and discovered this link. Which basically says that Magnesium Fluoride was used in the Sally Hansen Nail Prisms. Note that it also says this ingredient has been banned for use in cosmetics in Japan?! I also found this PDF document, which is a MSDS for a "Cellulose acetate solution". It details in this document, that the product may contain "metal-coated Magnesium Fluoride Mixture" - ie Spectraflair. It also says under other names for the product "Nail enamel, ozotic nail polish/lacquer, light reflecting multi-colour nail polish/lacquer." The document is from 2008, so I don't know if Ozotic polish still contains this, but it appears that it certainly used to. And a final note, please make sure you use your mask when handling the spectraflair and also please note that JDSU advised dosage should not be over 1% loading by weight in polish, which confirms that it is ok to put in nail polish. So now to just do a little math. A regular sized 15ml bottle is 0.5 fl oz. Which converts to 14.17 grams. Therefore you shouldn't be adding more than 0.14 grams of spectraflair to a bottle that size. Or slightly more than 1/10th of the jar I provide you with. Because not many people will have ultra fine scales like me, if you aim to create at least 8 regular sized bottles out of your gram of spectraflair, then you will be well within the 1% loading. I know this bit got a bit techo, but I wanted to make sure you all had the same info I did. Wow, they just keep getting better! Milky Way is...is...just...wow! How are you going to top this beauty? Oh maaannnn, this is awesome!! And I also loved the purple one you made. I should really do some more frankening, but I'm always afraid to waste good polish... And of course I don't have the spectraflair. Oh, and I wanted to mention that the Ozotic guide is really helpful, thanks! This one is just gorgeous! This one is so pretty! 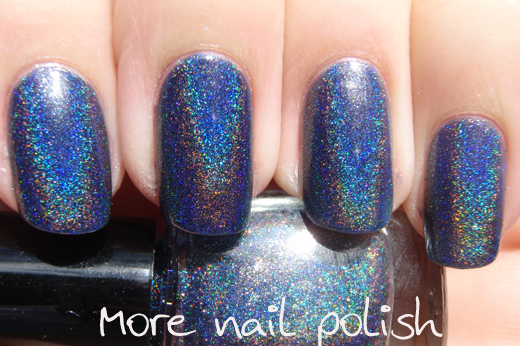 I love blue holos. And thank you for the SpectraFlair information; it was really helpful. Such a beautiful rainbow of glitter!! :) Spectraflair is the best!!! 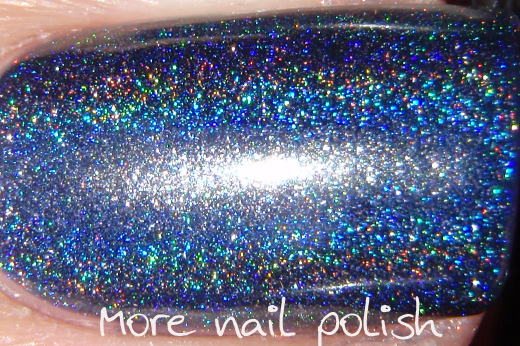 This is the holographic blue I have always wanted. I can't wait to try it out when my powder gets here. 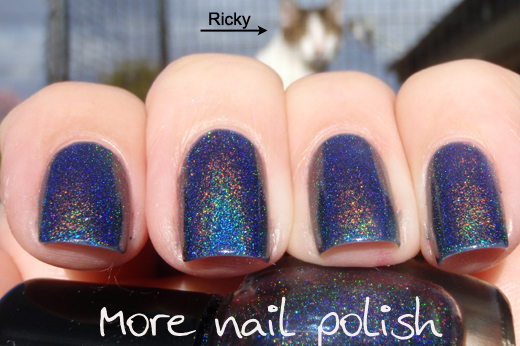 Or what about a dark green with lots of linear holo goodness. I know, I know, I should go and do it myself hahaha! Oooh, I was playing with Midnight Fever on Friday hoping for a result like this! 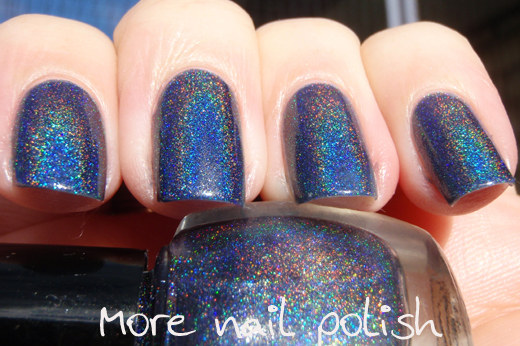 I think I need to decant some of my franken (which comes out as a sky blue holo) and add some more midnight. Thank you for the recipe!! Thank you so much for sharing your beautiful Spectraflair Frankens with us. I also appreciate the information on Magnesium Fluoride. I have been wondering where the beautiful multichromes of the past went (I live in the USA and don't have easy access to Ozotics and a nice multichrome is few and far between) , and have heard rumors that the pigments used are no longer deemed "safe". This is somewhat confirmed by the information on Magnesium Fluoride. Another great franken AND information post, thank you! Thanks for the heads up on the mag fluoride! I would have had no idea! You really should start selling your frankens. You really have a talent for it! Wow, I always learn a lot from your posts.... And that blue franken is gorgeous! I love all your franken holos. Thank you for providing more info about spectraflair. Thanks so much for the extra info about Spectraflair! Wow I definitely was not being careful enough when I made my two frankens. I love your franken. It kind of looks like Essie Starry Starry Night in the shade! Ohh wow, I love it. It is so beautiful!!! 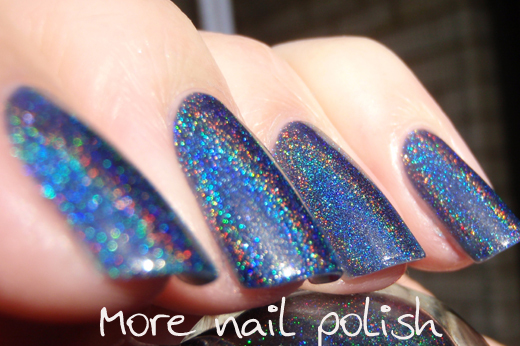 You've combined my two favourite things: blue and holo polish!! 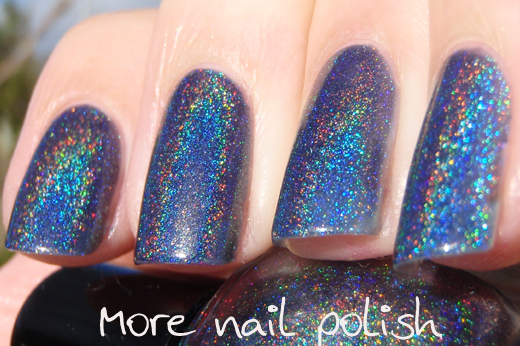 Seriously contemplating buying some of that Spectraflair now... how many polishes would you say 1gram makes!? you always make so great colors!! thanks a lot for all this information!!! I still have to obtain a mask, though. Gloves I already have. I'm really excited if I can make a nice dark blue holo ... it's what I have always wanted ... so thanks for all your photos and all that information! 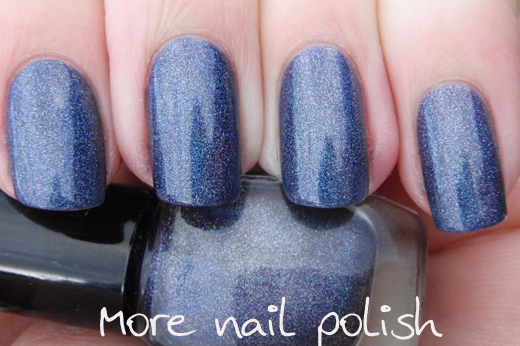 Looks like OPI DS Glamour... very nice!